To say the least, Indian Matrimony is parting ways with traditional customs and embracing the novelty. Indian Matrimony has come across a sea change than what it used to be in the past. In the Indian society, the decisions on marriages were taken by the parents rather than bride and groom themselves. There used to priests or matchmakers who would come with some names, information in bits and pieces and the process used to continue until a suitable match. There is no denying that traditional ways in Indian Matrimony had a very personal approach with all the matchmaking handled by relatives, close priests and parents. However, the developments in the procedure used to be time taking and often complex. 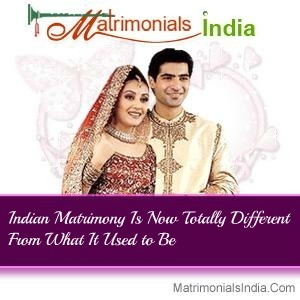 Now the scenario has changed with the emergence of a number of Indian Matrimonial Websites. The ends are still the same but the means have become more advanced and refined. What are the changes? The answers are many. Primarily, the matrimony that used to be prime concerns of the parents remains no more a burden. The tech savvy young generation has no hesitation in resorting to online means in the pursuit of their life partners. Earlier, where Indian matrimony used to be a thoroughly arranged affair through pre specified channels, now there is more inclination on selecting the spouses as per one's own choice. Love marriages and in fact arranged love marriages are more popular these days. Earlier, the social norms didn't permit the would be spouses to interact and share personal moments so as to develop an understanding. The stereotype is coming to a halt and to a fair extent Indian Matrimonial Websites can be accredited for the transformation. Social outlook has broadened and there is more emphasis on knowing one another before entering into a lifelong relationship. This is just an antithesis of traditional Indian Matrimonies. The role of matchmakers is overtaken by Indian Matrimonial Websites. Horoscopes are matched online. In fact, the first interactions are initiated through websites. These are progressive changes and indicate that the society is bold and mature enough to embrace modern ways and then use them to good effects.